Window cutouts in the door, check. Fabulous mid-mod colors, check. Glass block accents and amoeba-shaped gravel landscaping—check! Located near London, the charming entrance to this 1950s bungalow is just the beginning. 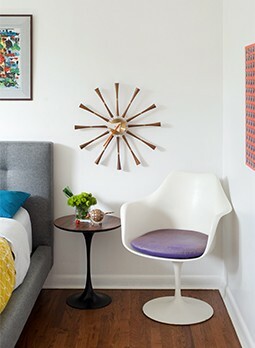 The entire house and back yard is dripping with atomic décor and retro goodness. Available to rent for video or photo shoots, this house is truly the perfect backdrop. 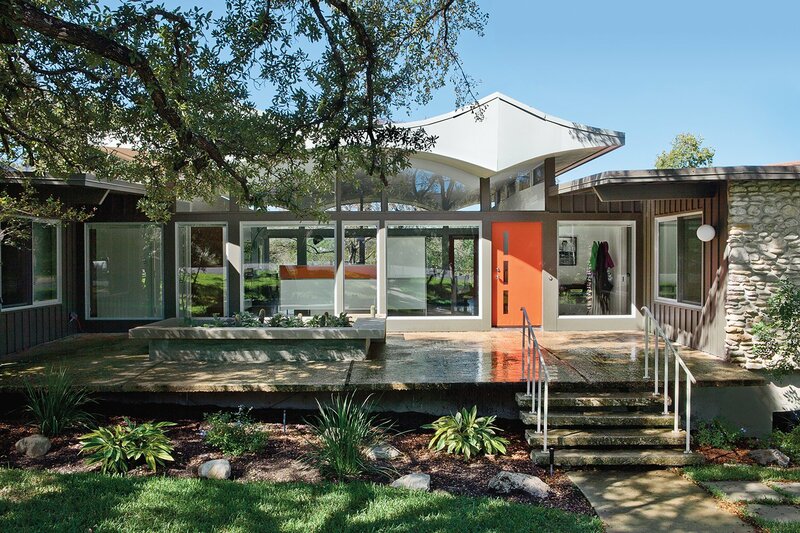 The unique silhouette of this 1964 Austin, Texas home is formed by an undulating roofline met by tall glass clerestory windows. 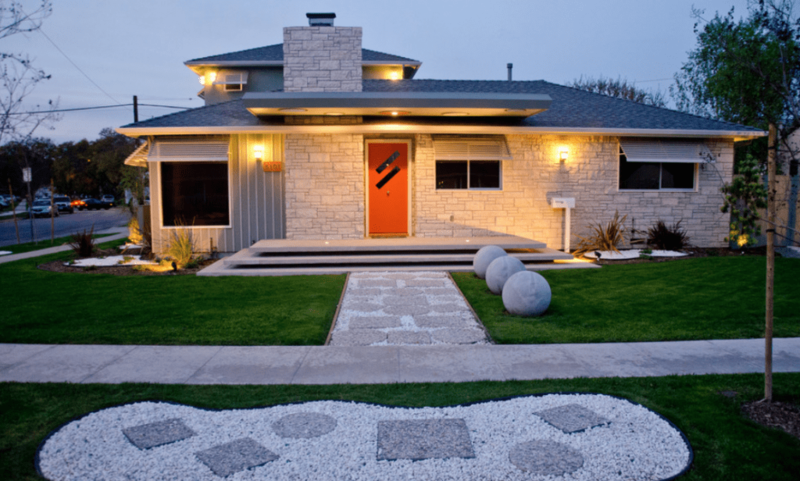 The cutouts and pop of orange on the front door provide a focal point, while the river stone wall creates a contrasting natural look. Strategically placed gravel, stones, and spheres create an artistic curbside appeal to this Los Altos, California home. Three floating stairs—which complement the staggered rooflines—allow access to a quintessentially mid mod front door. 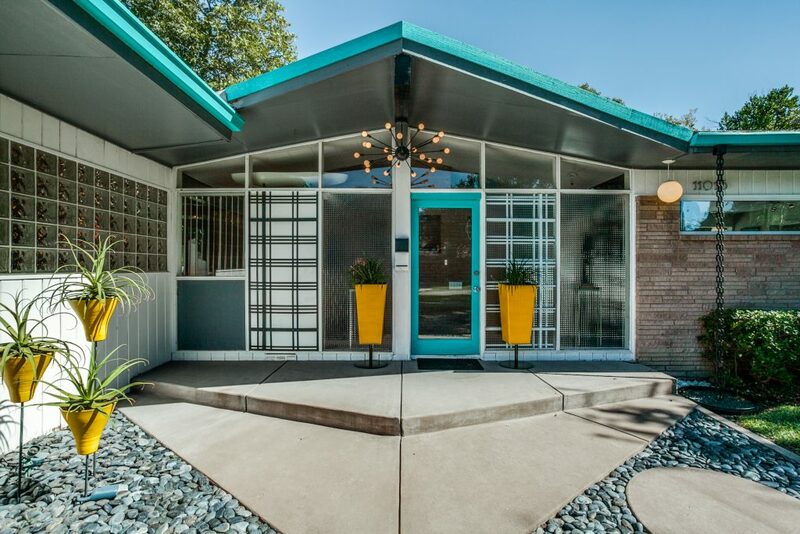 Combining bright retro colors with sharp jutting angles, this 1954 home gives a truly mod welcome. Topped off with a hanging sputnik light, the stacked stone and glass block features create even more texture in this Dallas, Texas front yard. A patch of AstroTurf, a lawn chair, and a few classic pink flamingoes create the perfect front yard for this 1962 trailer—as well as plenty of inspiration for a fun and funky twist for your front porch. 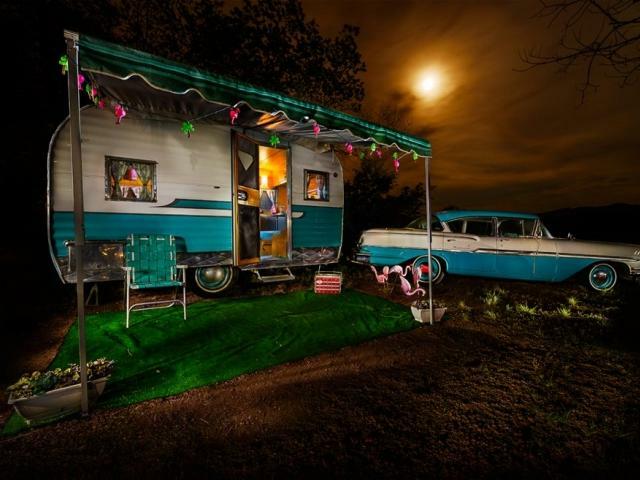 Located in Canon City, Colorado, the “Flamingo Lounge” is one of nine completely restored and furnished vintage trailers at the Starlite Classic Campground. Available to rent for certain groups, visit Star Lite Classic Campground to learn more. 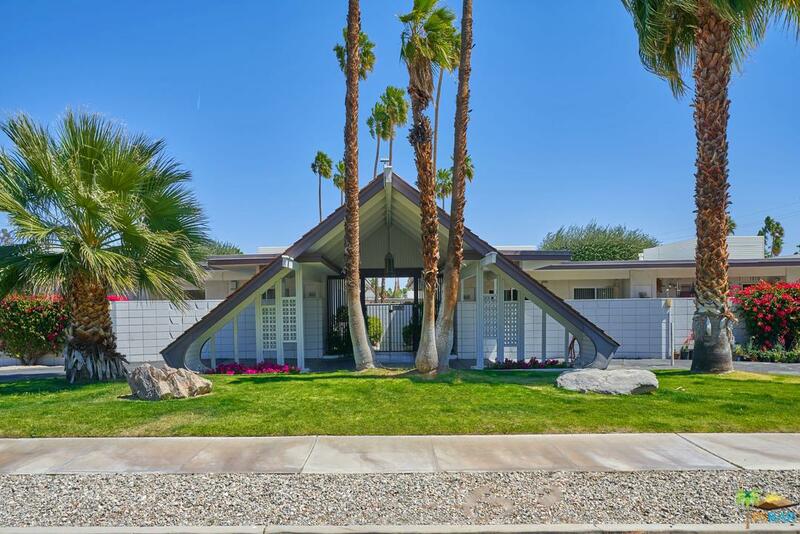 This famed Palm Springs, California home was originally built in 1960 by noted developer Robert Alexander for his wife, Helene. 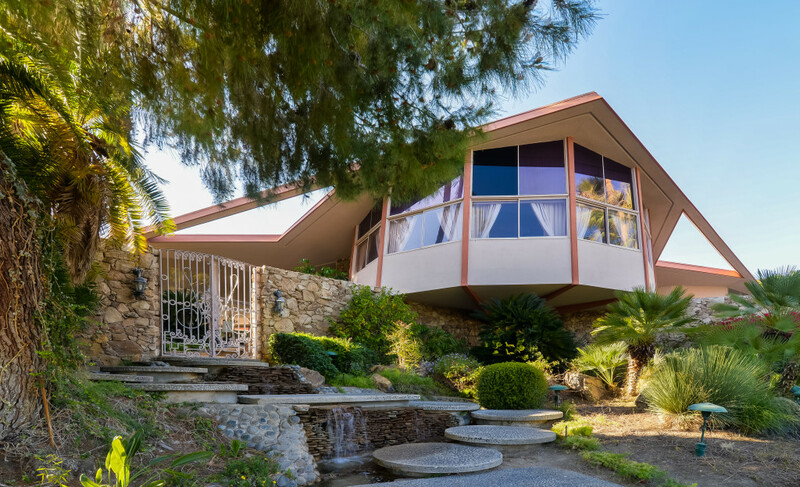 Dubbed “The House of Tomorrow” thanks to a famous 1962 “Look Magazine” spread, the home is also famous for Elvis and Priscilla’s 1967 honeymoon. The front yard features a cascading waterfall and a circular stone walkway, perhaps mimicking the home’s design—which consists of four perfect circles. 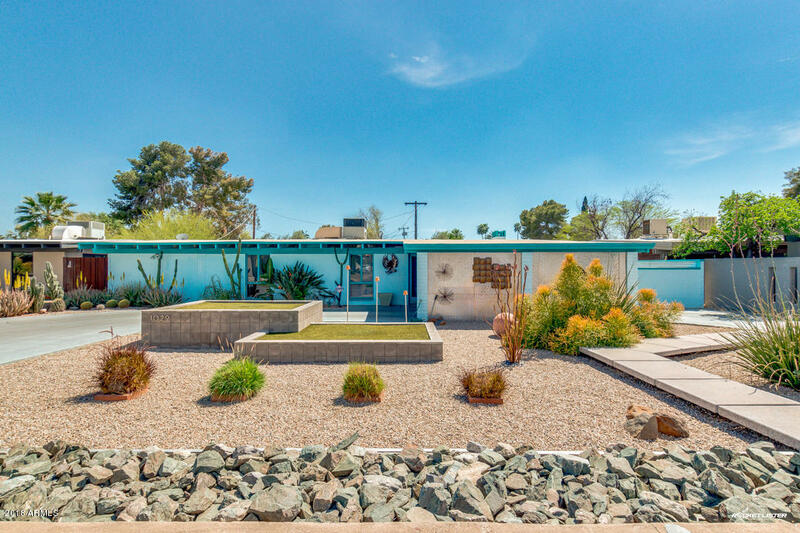 Overlapping square planters provide a visual break in the yard of this 1950 Ralph Hover home in Phoenix, Arizona. The bright blue exterior stands out against the desert landscaping, while the floating walkway blends in with its surroundings. Can a front yard be any more mid mod than Disneyland?! 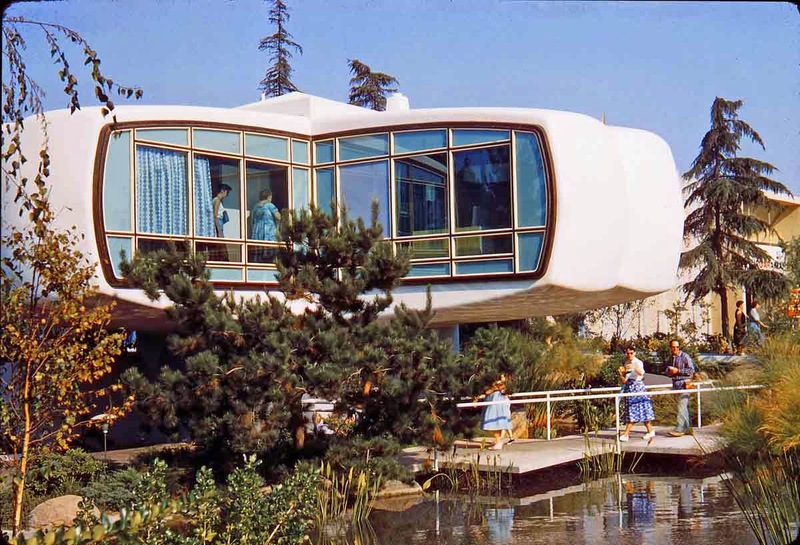 The Monsanto House of the Future was operational from 1957 through 1967 and offered guests a tour of what was to come in the far-off year of 1986. Made almost entirely of plastic, the house consisted of four wings suspended over a garden, complete with a waterfall and pond. When the attraction closed, not even a wrecking ball could knock down the reinforced polyester structure! Workers used hacksaws and choker chains to slowly dismantle the house over a period of two weeks. The Desert Lanai condo complex, built in the early 1960s, features the characteristic “Swiss Miss” style of architect Charles Dubois. The slightly curved bottom edges create a unique backdrop to this 82-unit Palm Springs, California complex. Unlike the usual xeriscaping found in the desert, green grass provides a lush welcome in this distinctive front yard. 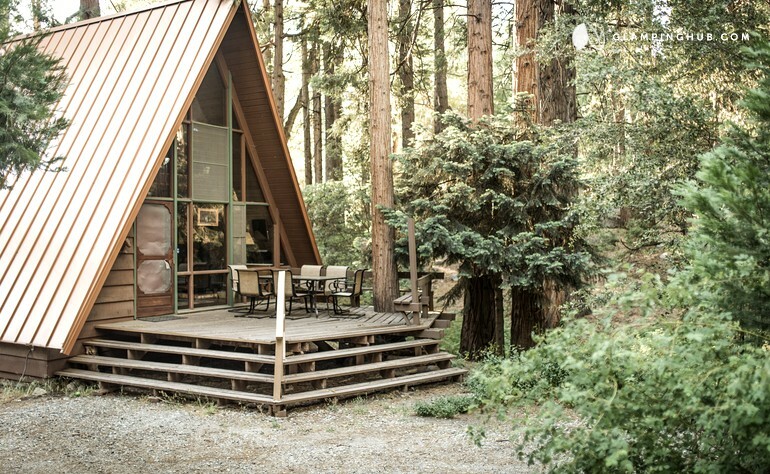 Nothing says “midcentury weekend getaway” like a cozy A-frame cabin in the woods. Pack up the family and head up to Idyllwild, California to camp in style at this charming rental house. Can’t you just imagine breathing in that fresh mountain air as you leisurely sip your morning coffee on the front porch? 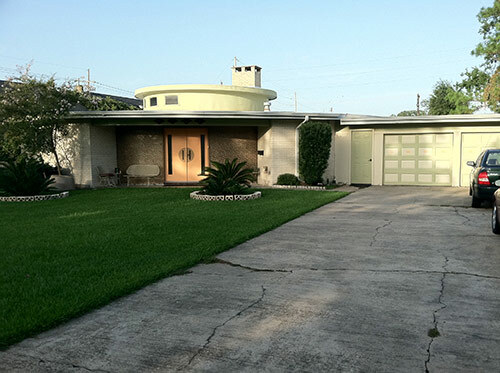 Once a heavy wood door, this 1964 round house got a fresh mod look with a bright set of double doors. Breezeblocks were used to line plant beds, and mosaic tiles provide contrast to this unique home’s front yard.